2007 Peterbilt 335 --- Single Axle, C7 Caterpillar 250 HP, Eaton-Fuller Manual 10 Speed, 4.11 Ratio, 12,000 Front Axle, 21,000 Rear Axle, 179" Wheelbase, 14' 11" Bridge, Spring, Air Brake, 14'8' Steel Niece Body, Aluminum Front Wheels, Aluminum Rear Wheels, Single Stack, Aluminum Fuel Tank, Peep Window, Air Ride Cab, High Level Interior, Wood Grain Dash, Chrome Gauge Package, Cruise Control, Tilt Steering Wheel, AM/FM CD, P/S, AC. 2005 Sterling LT9513 --- Tandem Axle, MBE 4000 Mercedes 450 HP, Allison Automatic, 488 Ratio, 14,700 Front Axle, 40,000 Rear Axle, 222" Wheelbase, 20' 9" Bridge, Hendrickson Haulmax, Air Brake, Differential Lock, Peep Window, Dual High Back Seats, Air Ride Seats, Cruise Control, AM/FM, P/S, AC. 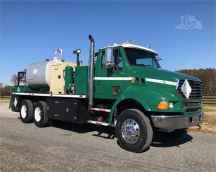 2004 FORD F750 XL --- Single Axle, C7 Caterpillar 275 HP, Allison Automatic 6 Speed, 12,000 Front Axle, 21,000 Rear Axle, 197" Wheelbase, 16' Bridge, Spring, Air Brake, 15.5' Steel Lube Body Body, Steel Wheels, Cruise Control, Tilt Steering Wheel, AM/FM, AC. New Arrival 1998 Freightliner FL80 --- Single Axle, 8.3 Cummins, Allison Automatic 6 Speed, 12,350 Front Axle, 23,000 Rear Axle, 180" Wheelbase, 15' Bridge, Spring, Double Frame, Air Brake, Amthore Body, Steel Wheels, Aluminum Fuel Tank, AM/FM, P/S, AC.